This guide is meant to be a comprehensive resource for basic Counter-Strike questions and beginner setup. While much of the content here is original, this guide is primarily a summary and consolidation of a lot of disparate community-generated guides. If you still have questions after reading this guide, please post them here! Not only will we help you answer your question, but we can add the information to the guide for future readers. On bomb defusal maps, the Terrorist team of five players is attempting to detonate a bomb at one of two bombsites. Their goal is to enter one of the bombsites, plant the bomb, and guard it until it explodes to ensure that a Counter-Terrorist does not defuse it. They can also win the round by simply killing all the Counter-Terrorists. The Counter-Terrorist team of five players attempts to defeat the Terrorists by either killing the T team before they can plant the bomb, or defusing the bomb before it explodes. In hostage rescue mode, the roles are reversed. Counter-Terrorists have to attempt to enter one of two hostage zones and rescue one of the hostages and bring the hostage back to CT spawn (the hostage rescue point). The Terrorists attempt to stop the CTs from accomplishing this objective by either killing all the CTs or by causing enough difficulty to the CTs that they run out of time in the round. Counter-Strike also has a rich community with many community-made gameplay mods. These include zombie attack, jailbreak and other roleplay mods, surf, capture the flag, Multi 1v1 Arenas, and many others. Counter-Strike is fundamentally a game of individual skill and tight teamwork. There is no system of leveling up your character, and there is no pay-to-win economy. A person who just bought Counter-Strike is playing the exact same game as a person who has played 3,000 hours in it - the only thing that can distinguish them is their individual skill and their strength as a teammate. Nobody will have over powered weapons, armor, or skills. Counter-Strike is a twitch-based shooter. Your success in this game will be directly related to how well you can control your character and his crosshair placement, which means how well you play is going to be directly affected by how good your mouse is. This post will have some of the basic information about how to pick and configure your mouse for Counter-Strike. If you would like more in-depth information, I highly recommend the overclock.net "truthful mouse guide". Mouse pads are generally about personal preference. Make sure you pick one that is large enough for your area and your playstyle. Laser mice work better on hard, flat surfaces; and optical mice do better on solid-colored, textured surfaces. The most important thing to consider when picking a mouse is what type of sensor it has. A good sensor will not interpolate or predict mouse position and will have a very low lift-off (meaning it will stop moving as soon as you lift your mouse off your mousepad). ADNS-9500/9800: Avoid this sensor at all costs; it is not worth the problems. These are in the most common heavily-marketed "gaming" mice, including the Logitech G500, Steelseries Sensei, and M65/95. Do not fall for the marketing jargon - no matter how many times the word "gaming" is written on the package, if it has this sensor it is not a good mouse for CS:GO. Philips Twin-Eye: These sensors do not introduce acceleration but they suffer from lift off problems and tend to break. Pixart 3305DK: Considered near-flawless, they do introduce a very limited amount of prediction. ADNS-3090 and its variants: These are considered flawless. Pixart PMW3310DH:The latest and greatest sensor. Flawless with perfect CPI scaling and high PCS(Perfect Control Speed). A comprehensive and frequently updated list of the best gaming mice available can be found here. Remember, it is important to pick a mouse that is comfortable for the size of your hand and your mouse grip preference. The polling rate of a USB mouse refers to how frequently the computer will scan the mouse for its current position. That means that, generally, the higher you set your polling rate the more accurately your computer will read your mouse's position. 500hz is usually recommended as higher polling rates do cause more CPU load and can sometimes be unstable, but there can be stability variations even between two mice of the same model, so it's important to make a decision based on your specific mouse. Try different polling rates and see if one is more accurate than the others. First DPI is not the proper term related to mice, it's Counts Per Inch (CPI). However, for familiarity we will use DPI in this guide. You can read more about DPI at the overclock.net "truthful mouse guide", but generally speaking, your DPI has nothing to do with how good your mouse is. The most important thing with DPI is not getting the "highest" DPI or even getting the "lowest" DPI like many "experienced" CS players will claim. The most important thing is to make sure that your mouse is operating at the native DPI of the sensor. If your mouse is not operating at its native DPI, it is using the firmware to either skip/drop "counts" or interpolate the position of the mouse. Remember, interpolation introduces guesswork into the mouse positioning, which makes it inherently less accurate. Make sure you don't fall into the hype of setting your Razer Deathadder (which has a native DPI if 1800) to 400 because everybody is telling you that lower DPI is better. If you absolutely cannot play on your mouse's native DPI, playing on a multiple of the DPI usually results in acceptable performance. Any problems are usually more noticeable if you scale up than if you scale down. So for example, playing with the Deathadder at 900 DPI (a multiple of 1/2 of the native) shouldn't produce noticeable problems. Nowadays, most flawless sensors will scale input accurately and you can choose any DPI you want, but be careful to really pay attention to whether or not it is accurately mapping your movements. When you move your mouse, your mouse sends positional data to the program it is communicating with. This program is generally Windows. Your mouse tells Windows "The user moved the mouse X distance, please move the cursor Y distance". In the options in-game, you can choose to have raw_input either on or off. Having raw_input on takes your mouse position directly from your mouse, bypassing any communication with Windows. Having raw_input off tells the game to take the mouse position from where Windows says it is. There is still debate about the efficacy of raw_input in game. It is possible that the implementation of raw_input in CS:GO introduces inaccuracy or smoothing, but that having raw_input off introduces acceleration when your cursor reaches the edge of the screen in windows and has to be snapped back to the center. I suggest playing a bit with both settings and deciding which is more comfortable to you. We recommended you set the command "m_mousespeed" to "0" if you use Raw Input. There seems to be an added smoothing effect with this command set to anything else. I recommend using these settings even if you have raw_input on, but you must use them if you have raw_input off. In Windows, make sure your sensitivity is set to 6/11 and you have "Enhance Mouse Precision" unchecked. Setting your windows sensitivity to anything but 6 will cause interpolation, and "Enhance Mouse Precision" will introduce mouse acceleration. Mouse acceleration is an added property of mice that takes not only the distance traveled but also the speed at which the mouse traveled to determine new position. For example, with mouse acceleration off, the cursor will move the same distance if I move the mouse slowly one inch or if I move it quickly one inch. With mouse acceleration on, the cursor will move a smaller distance if I move the mouse slowly one inch and will move a larger distance if I move it quickly one inch. There are two main schools of thought with mouse acceleration. Most members of the Professional Counter-Strike community believe that disabling mouse acceleration is advantageous. This allows your body to only have to develop one type of muscle memory - moving your mouse X distance physically moves your crosshair Y distance in game, all day every day, no matter what. A few professionals, however, think that developing muscle memory around mouse acceleration is an important skill. By using mouse acceleration, a person could have the ability to easily spin around a full 180 degrees (by moving their mouse quickly) while maintaining the ability to make one-pixel changes to their crosshair for long distance AK sniping. Generally, though, new players will be advised to turn mouse acceleration off. Once you've gotten all of these other settings down, you can finally adjust your in-game mouse sensitivity. When picking a sensitivity, you need to consider all the things you might be doing. For example, you may be playing a 1v1 with no more flashbangs, and you have to come around a corner and quickly peek left and then swing 180 degrees to peek right. You also may be standing at the back of A platform on de_dust2 with an AK, trying to hit the tip of a guy's head in pit, having to move your mouse very slightly to pick him. You also need to consider how much of your arm you move when playing - do you play more with your wrist or with your elbow? Generally, the lower the sensitivity you can comfortably play at, the better. It is much more likely that you will have to make precise few-pixel movements to catch a guy than you will have to turn a full 180 degrees with one swoop of your mouse. When you are new, you may find yourself in more situations that require a complete 180, but as you continue to improve and learn the game you will be able to position yourself so that it is much less likely that you will need to make such drastic movements. As you play, continue lowering your sensitivity as much as possible as you begin to rely on good positioning to avoid 180 degree turns. Here is an interesting video about how to find your "perfect" CS:GO sensitivity. The ideas within the video are very good (finding a sensitivity that allows you to maintain accurate position on a small target while moving), but I do caution against such a prescribed method of find a "perfect" sensitivity. Personally, I think preference goes a lot further than following an algorithm such as this exactly, but at the very least it provides a really great starting point for you and a great explanation of what to look for when fine tuning your sensitivity. 1. The combination of your DPI and your sensitivity must allow you to place your crosshair on every individual pixel. There is a minimum possible movement you can make with your hand, if that movement causes your crosshair to move multiple pixels, then you are "pixel skipping". This is bad. You must lower your sensitivity until this is achieved. 2. Now there is a "too low" as well. Based on your mouse surface, you must be able to complete a 180 degree turn, both left and right, easily. Most players tend to get larger surfaces (Steelseries QcK+ and that jazz). If this is not possible for you, raise your sensitivity until this is possible without sacrificing the above skipping rule. A lot of players, as they start improving, will "hit a wall", and begin changing all their settings in the hope that it will improve their game. DON'T DO THIS. Maintaining a consistent mouse sensitivity is important for developing muscle memory, and maintaining muscle memory is key to continuing to improve. Changing around your settings might make you feel like you're doing better for a game or two, but in the long run it will hinder your progress. The only changes to your mouse sensitivity you should make are planned reductions in mouse sensitivity as you improve. Your keyboard is less important than your mouse, especially in Counter-Strike:GO as compared to previous version of Counter Strike, because there is a much lower skill ceiling when it comes to movement. However, having a good keyboard can provide some advantage once you start relying on high level movement such as bunnyhopping or AWP movement strategies. Mechanical keyboards are superior to membrane keyboards in every way. When choosing a mechanical keyboard, the most important thing is picking a switch that feels good. This page from DasKeyboard provides a really good explanation of each type of keyboard switch. Notice that the black switch is considered to be the best for gaming because the actuation point and the release points are at the same point (making double tapping easier), and blue switches are considered poor for gaming because the release point is actually above the actuation point. Cherry switches were considered the industry leaders until their patent ran out. Now, there is a wide variety of very high quality switches to choose from. Make sure to read the reviews of any potential keyboard you are thinking of purchasing to find any common issues. When picking a gaming monitor, the most important feature is refresh rate. The refresh rate determines how frequently the image on your monitor is updated. Counter-Strike is a highly fps-dependent game, and though you will benefit from a higher fps no matter what your monitor's refresh rate, having a monitor that can actually display more of the updated frames to you will provide you with an advantage. Most monitors have only a 60hz refresh rate, so make sure when shopping for a monitor you actively look for a higher refresh rate. The higher, the better. Don't settle for a 120hz if you can find a 144hz in your budget. Beyond refresh rate, be sure you are looking for a monitor with a TN panel with low input delay and no ghosting. If possible, NEVER use an HDMI connection. HDMI is fine if you're using your native resolution at 60hz, but DVI and VGA will allow a greater number of resolution options at higher refresh rates. (Check the user manual for which refresh rates are supported by which interface.) Since you bought your monitor for its high refresh rate, don't cripple it again by using HDMI. Once you've purchased your monitor, be sure to calibrate it for the best picture quality. If you purchase a 120hz monitor, and you do notice some motion blur, try using the Lighboost Utility. This helps reduce motion blur, but note that the highest supported refresh rate is 120hz. Being able to hear in game is a huge asset to your gameplay. The ability to pinpoint the exact location of an enemy based solely on an accidental footstep or gunshot is so beneficial that players with less-high-quality headsets will often accuse others of hacking because they don't realize how far away you can actually hear in-game sounds. Besides a good mouse, a good headset is the most important piece of peripheral hardware for your gaming experience. When picking a headset for Counter-Strike, be sure to pick one with strong mid-range reproduction. Counter-Strike does not have much low bass or high treble. Do not get a surround sound headset, virtual or physical. Counter-Strike:Global Offensive has software-coded positional audio. If you purchase a headset that has it's own software-coded positional audio, you will be adding a layer of encoding to the sound you receive and it will be significantly harder to locate the position of a sound. Surround sound headsets cost more and will actually hurt your in-game sound-recognition ability. A good selection of gaming headsets can be found here. You can also purchase a set of good studio headphones and augment them with a Zalman headphone microphone. Studio headsets offer more "bang for their buck" because you're not purchasing the convenience of an all-in-one headset. Most modern-day operating systems, Windows included, have on-by-default power saving features. This is not ideal for a gaming environment because it can negatively affect the amount of resources the game can use. These power saving features control CPU speed, USB input, and hard drive responsiveness, all of which can impact your game. Set your Windows Power Profile to High Performance. Warning: Use at your own risk. Update your BIOS to the newest stable version. Consult your motherboard manual before changing anything. Never "Force" anything; let the application decide. Avoid using wireless internet. Wireless connections are unreliable and a burden in a fast-paced online experience. Uninstall programs you no longer use. Close applications you don't need to have open to play the game, especially browsers with flash applets. Disable applications from starting automatically when your computer turns on with msconfig. If using a mechanical hard drive, use disk cleanup and defragmentation software regularly. Use a lightweight Anti-Virus program and, if problems occur, disable any real-time protection while you are playing. Avoid resource intensive suites like Norton or Intel Security (previously known as McAfee). CS:GO has much fewer necessary launch options than previous version of Counter Strike. To set any launch options, right click the game in your Steam Library, choose Properties, and then choose Set Launch Options. I also use the -novid command to avoid having to see the splash screens before the game loads. Many people choose to add the -console launch option instead of enabling the developer console directly through the Game Settings menu in game. Here is a complete list of all possible launch options if you would like to use others. The main goal of editing your video settings should always be to maximize the fps you are getting while still maintaining visibility. I'm going to say that again, because there are so many misconceptions about this. You should always maximize your fps. 60 isn't "good enough" if you can get more. Capping your fps at 200 isn't a good choice if you can get 250. I think 3kliksphilip's video about this issue is one of the most intuitive, and I highly suggest watching it if you are even slightly caught up in the misconception that capping or reducing your fps is ever a good idea. The more fps you get, the more smoothly your game will run and the more accurately you will be able to play, but at some point you'll be sacrificing a lot of visibility for only a little return in fps. There are two important considerations when picking a resolution to play at: aspect ratio and actual resolution. This image, taken from http://pantheones.com.au, visually displays the field of view of each resolution. 16:9 gives the widest field of view, while 4:3 gives the narrowest. 16:10 is about half way in between. There is much debate over whether a 4:3 aspect ratio is better or a 16:9 is better. While 4:3 greatly reduces your field of view, which could cause a player to be more easily flanked or shot by a player just outside the 4:3 field of view but within the 16:9 field of view, many players would contend that a good player would never put themselves in that position. They would constantly be checking all corners, would have an understanding of where a player can and can't be based on how much time has passed since the round start or since an area has been checked, and will always either have a teammate watching their flank or will make sure to put themselves in a position to where they cannot be flanked. They will then contend that the extra field of view is unnecessary, but 4:3 has the added benefit of reducing the amount of visual information that must be processed. Since the brain is notoriously bad at multitasking, the conclusion from those people is that 4:3 is a better field of view because the extra field of view is unnecessary and processing less visual information allows a player to process the information they do see more quickly. The benefits of 16:9 are basically the opposite of 4:3. The greater field of view means that a player has less likelihood of being flanked, does not need to rely on the faith that their teammate (who may or may not be a complete stranger) has their back, and they would have a less limited number of positions they could maintain by themselves where they cannot be flanked. The number of times that I have personally seen through a teammate's view an enemy that they didn't respond to because they are playing on 4:3 and I am on 16:9 has led me personally to stick with a 16:9 aspect ratio notwithstanding the benefits of a 4:3 aspect ratio, but you should test both and see which you prefer. Note that most modern day monitors have a 16:9 size and would require either stretching of the image or black bars to display a 4:3 (or 16:10) aspect ratio. Each aspect ratio has a set of actual resolutions that goes along with it. With monitors supporting ever-increasing resolutions, this list will not be able to contain every possible aspect ratio. Click here for a more comprehensive list. Maintaining a higher resolution makes the game look prettier, but lowering your resolution will cause less GPU strain and allow you greater fps. You'll have to pick the best balance between visibility and fps based on your GPU. Since the Source Engine is very CPU heavy, changing your resolution may not even do much good unless you have a really low-end GPU. Before reading all this, you should watch this video, which gives a really good overview of the video options as well. Brightness controls the brightness of the game. It's important that the brightness is high enough that you can see people in dark places (try looking in CT spawn on dust2, or the dark area of hut on nuke, or the dark spot in B bombsite in inferno), while not washing out the lighter colors (check to be sure the terrorist models on vertigo don't wash in to the light walls). Color mode effects the contrast of the game. Fullscreen plays the game in full screen. This screen has full control of your monitor and must be minimized when alt+tabbed. Fullscreen Windowed plays in fullscreen, but it's in its own separate window. This makes alt+tabbing out of the game really easy and also allows for streaming via software applications such as OBS or XSplit. Playing in full screen windowed requires you to play in the same resolution as Windows. Windowed mode plays in a window that is a lower resolution than your Windows resolution. "In Laptop Power Saving Mode, the game intentionally runs at a low frame rate in order to preserve battery power, extending the amount of time you can play on battery power." In other words, don't use this unless you absolutely have to. Allows you to customize where your steam notifications appear. I use the upper left, as there is very little important information in this area of the screen, since I have configured my radar to fall further inside my monitor than the notifications. Most of the advanced video settings have no impact on competitive gameplay. Setting these as low as tolerable will increase framerate. However, you should set Effect Detail and Shader Settings to "high" to allow you to see through molotovs more easily. Affects how good ground shadows cast by props look. Changes how good textures look, including player models. Experiment with different settings to determine which makes opposite team players easier to identify. Not only does this change the complexity of drawn details (such as blood spatters and explosions) but also effects draw distance. This changes how light bounces off of objects. Some people claim that having it higher makes it easier to spot enemies. (I think it makes enemies look "shiny" and stand out.) It also makes gun skins look better. Allows CS:GO to utilize multiple CPU cores. Set this to enabled if possible. Basically, anti-aliasing makes lines appear smooth instead of pixelated. Lowering anti-aliasing increases framerate. Click this link to learn more about Multi-Sample anti-aliasing. A different type of anti-aliasing that you can read about here. Again, disabling will improve framerate. Vertical sync locks your game's framerate to your computer monitor's refresh rate. Having a locked framerate is disadvantageous in Counter-Strike as a higher framerate increases game fidelity and a locked framerate produces input lag. You should have already disabled vertical sync in your GPU control panel, but just to be on the safe side disable it here, too. Keep this disabled. You don't want to play a blurry game. New CS:GO style crosshair. The crosshair expands while moving and shooting. New CS:GO style crosshair. The crosshair does not expand while moving or shooting. Old CS style crosshair. The crosshair expands while moving and shooting. Old CS style crosshair. The crosshair expands a lot while moving and shooting. Old CS style crosshair. The crosshair does not expand while moving or shooting. Many new players prefer a dynamic crosshair because the expansion of the crosshair when shooting can give them a good idea of how long it takes the recoil of the weapon to "cool down" for another accurate shot. Once players get the hang of the timing of the weapons, they often feel this crosshair expansion is distracting and switch to a static crosshair. You can have even more control over the way your crosshair looks in game by changing various cvars either in console or in your autoexec.cfg (more on that here). This website allows you to customize your crosshair in real time with a visual preview. It gives you all the cvars you need to create the crosshair you desire. This reddit thread has a bunch more examples of people's crosshairs. There are some important cvars to set to improve the way in which your client sends and receives information from the server. It is important to have these set correctly so as to allow your client to receive the most up-to-date information possible. Some servers will "force" your rates for you (ie, they will use server-side cvars to force your rates up to the highest rate possible even though the default settings are quite low), but this can cause a lot of clients on poor internet connections to experience problems. Server owners who know how to run their servers properly won't force their clients to a particular rate, and therefore it's important that you set them yourselves. These rates should be placed in your autoexec.cfg. Many people will say that capping your fps to any value with produce input lag when your computer is capable of going above the capped rate but the fps_max is preventing it. For this reason, I suggest not capping your fps. Others, however, will say that consistent fps is better, because a player will be able to notice differences in fps fluctuations more easily than they will be able to notice input lag. cl_cmdrate is how many updates you want your client to send to the server. Set this to 128 even if you are not playing on a 128 tick server. If you are playing on a 64 or 102.4 tick server, the server will automatically lower this for you. The only reason you should lower this value is if you have such terrible internet that sending 128 updates to the server would lag you. cl_updaterate is the opposite of cl_cmdrate. It tells the server how many updates you want from it every second. Again, you should keep this at 128 unless your internet can't handle it. This is the maximum number of bytes that the client can receive from the server per second. Again, keep this as high as possible. The two commands in conjunction with each other specify less interpolation (remember, interpolation is a fancy word for guesswork) of client positions. You will see a more accurate representation of other players and of yourself, but this can cause the game to look laggy if you have horrible internet. It will also make the horrendous hit registry issues of Valve's 64 tick servers more apparent, so some people suggest playing with cl_interp_ratio 2 on a valve server. I disagree with this thought process as it does not improve hitreg, it just makes it appear like it does. Remember, CS:GO has its own positional audio, which is optimized for headphone configuration. You should not be using your own surround sound, either physical or virtual, while playing Counter-Strike. For this reason, make sure that you have the in-game audio settings to "Headphone". In-game volume setting is personal preference, but the louder you can play the game the greater your chance of hearing the footsteps of an enemy or other important information. You should turn off in-game music. It can cover up important sounds during a clutch situation after the bomb has been planted, and any information you can gather from the music (for example, how many seconds until the bomb explodes) can also be gathered from in-game sounds. Set your microphone to Press to Talk. It's disruptive in the middle of a match to suddenly hear your little brother screaming or hear you burping. You can't have any unwanted noises during a match and having an open mic makes it impossible to control how much noise goes through. You can now set your in-game input and output devices independent of what Windows has set. This is really great if you like to listen to music while playing, as you can now play the music through speakers while your game is in your headset without having to use any particular media player. snd_mixahead "0.05" //Lowers the delay or "buffer" when playing sounds in game. snd_headphone_pan_exponent "1" //Sets the Pan-Law which determines crossfade positioning. Make sure your headphones are configured correctly for Stereo use. Right click the Windows taskbar speaker icon, and select Playback Devices. Select your headphone device(Probably named Speakers) and match the values shown here. Right click the Windows taskbar speaker icon, and select Recording Devices. Select your headphone device and click Properties. Here you can choose to listen to the device (for testing). Choose volume and boost settings that are loud enough while minimizing background noise. You will want to disable any effect options as well as exclusive mode. Here is an album of what settings are preferred. One of the most important features of CS:GO is the buy system. What weapons will you buy with the money you have to make your chance of success the greatest? (This will be discussed more in-depth here.) Many players prefer to set up buy binds instead of learning the buy menu. I think this is slightly less advantageous as it's easier to accidentally hit one key and buy a weapon that you don't want than it is to accidentally open up the buy menu, proceed through a submenu, and then accidentally buy a weapon you don't want. But if you're not clumsy, it may not be an issue, and it can greatly speed up a new player's ability to buy weapons. However, if you take the time to learn the buy menu, buying weapons through the menu can be just as speedy. All buy binds should be set in the autoexec.cfg file. I've found that many people have trouble correctly making an autoexec.cfg file, and some of this is due to errors with CS:GO. An autoexec file should be executed automatically on launch, but it often isn't and there are workarounds a person must do to get the autoexec working. Furthermore, for some brilliant reason, autoexec is executed before the default config, so many settings in your autoexec will be overwritten when your default config is launched. For this reason, I always suggest that users place their custom configs in a file named userconfig.cfg (or whatever) instead. They are both the same in practice, but I find it much easier to get a custom configuration file working properly if it is not called autoexec.cfg. Your userconfig.cfg is where you should put the majority of your personal configuration settings. Some settings can't be set in the normal config.cfg file, and by setting your personal configs in your userconfig.cfg you ensure that you don't accidentally reset them or mess them up in game. (There have even been reports from people who have simply watched a demo of another player and had all their settings set to the settings of the other player.) It makes it very easy to test different settings in game without having to worry about what you changed and how to get back to normal. If you decide you like your new settings, place them in your userconfig.cfg file; if you didn't like themm, they will be reset when you relaunch the game. You must create your userconfig.cfg file - it is not included in a default install of CS:GO. I recommend using a program such as Notepad++ or Sublime Text as Windows Notepad usually can't parse the config file meaningfully. Open a new file through Notepad++ or Sublime Text and enter all your important cvars (as discussed above). When you are done, make sure you save it as a config file by choosing the file type "All file types" and naming it userconfig.cfg. Be sure you don't accidentally save it as a text file or it won't work! Note: If you have installed CS:GO in a different directory from your base Steam install, your files will be in slightly different locations. Here is the file structure of my install. Config file - in the Steam base directory. Then be sure to make your config.cfg read-only. If you do not make the file read-only, this line will be deleted from your config every time you load the game. Since all of your custom configs are going in your userconfig anyway, it's not really necessary to ever write to this file. Many people will simply make a copy of config.cfg, rename it userconfig.cfg, and then delete everything from their config.cfg except for the line "exec userconfig.cfg". This makes it a lot easier to edit your settings, because you don't have to remember if you set such-and-such cvar in your config.cfg or your userconfig.cfg. If you would like to see some examples of various userconfigs, many clan members have posted their in this thread. You can also find an example of a high performance or competitive autoexec here. Remember, though - your config does not make you a pro. Aside from the settings posted above, any other settings should be left to your personal choice. The most important thing is that you're able to play comfortably and confidently with your config. Weapons listed in black indicate that they are available to both teams. Red weapons are only available to Terrorists and blue weapons are only available to Counter-Terrorists. *These weapons must be enabled in your Loadout to be used. By playing Counter-Strike on any VAC-secured server, you have the opportunity to get cosmetic weapon skin drops or crate drops. You will usually receive about four drops per week. These skins are purely cosmetic and have no impact on the way the weapons behave. If you receive a skin, you can apply it to your weapon through the Loadout menu, you can trade it to another player, you can sell it on the Community Market, or you can use the Arms Deal Contract to "craft" ten weapons of one quality for a weapon of higher quality. Crates can be opened with keys purchased in-game. Weapon skins from crates are a higher quality than those from drops and can usually be sold for money at the market. You also have a chance of getting a StatTrak weapon from a crate, which is a weapon that counts all your non-bot kills. Knives can only be acquired from crates (or purchased from the market). The money system in Counter-Strike is one of the biggest tactical aspects of the game. At the beginning of the match, each player spawns with $800 and just a pistol and a knife. The players must skillfully manage their money and equipment to have a greater likelihood of accomplishing their goals. Players earn money by getting kills and by winning rounds, and they can use that money to buy better weapons. But if a player dies, he or she must rebuy their weapons with the money they have left. Players can earn money by accomplishing objectives, getting kills, or winning rounds. A handy but incomplete infographic of the money system can be found here. Counter-Strike is fundamentally a team game. During a match, a team must generally buy together and save together. It is important to know if your team is buying or saving. If you buy when the rest of your team is saving, chances are you will die that round because your teammates don't have the resources to cover you and it's very difficult to take on an entire team single handedly. This means that you probably no longer have enough money to buy a weapon the next round, and your team is forced to play the next round 4v5. By buying together, you enure that you are able to attack the other team with your greatest amount of force for the greatest number of rounds. When you are buying together with your team, make sure that your buys are complementing each other effectively. A team of 5 AWPers is not going to be very effective on a map like Nuke, which has a lot of close quarters. Communicate with your team to ensure that you are buying in a way that maximizes your advantage on the map. Another important part of team money management is being aware of your teammates' money and whether or not they need a "drop", which is where you buy a weapon for your teammate. For example, if you can either buy an AWP or two AK-47's, and your teammate can't buy any gun, it's important to recognize that and offer your teammate a "drop". An oft-overlooked aspect of team money management is predicting how much money the other team has and what they can buy. The point of buying weapons is to counter the other team, which means you need to be able to predict what they might be buying. To allow of these balancing acts to occur, a player has to make sure to only buy near the end of the freezetime, after the in-game leader has been able to call a buy or save and after each player has assessed their own ability to buy weapons for themselves and others. During free time, you can see your teammates' money and their current loadout above their heads. This makes it even easier to manage team money and there is no excuse in CS:GO to not be doing so. "Pistol round" refers to the first round of the game, when each player has only a pistol and $800. $800 is not enough money to buy any other gun except a different pistol, and perhaps a few grenades or kevlar. Thus every member of both teams will only have a pistol and will not have a helmet. Because you can be assured that nobody on the other team has a helmet (a helmet costs $1000), it is best to stick with the starter pistols (the Glock or the P2000). The P2000 one-shot kills with a headshot from any distance, and the Glock can one-shot kill from medium to short range and two-shot kill at longer ranges. By learning how to use the starter pistols, you can use your money on a variety of grenades, which are very helpful for pistol-round strategies, or save enough money to buy an AWP third round. Pistol round is generally considered one of the most important rounds of the game (though it's certainly less important than in the past, with the current MR15 format) - for this reason, many people will buy out grenades during pistol round. A simple flashbang or well-placed smoke can assure your victory in pistol round. Eco rounds (short for economy, meaning you're buying economically) occur when the team does not have enough money to full buy. On eco rounds, players will generally buy a better pistol that can counter enemies with kevlar and helmet (both the P2000 and the Glock are bad against armored enemies, and after the pistol round the opponent will almost always have kevlar and a helmet if they won the previous round), an assortment of grenades, and possibly kevlar. If one player has an excess of cash on an eco round, they may choose to buy a cheap SMG such as an MP9. Eco round strategies will revolve around closing the distance before engaging - since most pistols are better at closer ranges - by using grenades and diversionary tactics. Don't assume that just because it's an eco round you're probably going to lose. Many players start doing really stupid things or rushing into danger with no care in the world because it's an eco round and they're "probably going to die anyway". A good eco round strat with well placed grenades can be successful and can earn your team free weapons. If I can be sure that the other team is not capable of purchasing weapons, I can anti-eco by purchasing cheap weapons that I know are good enough to get the job done. For example, our team can purchase shotguns and submachine guns, depending on what each player is comfortable with. Since the other team only has pistols, I will probably be able to kill them with the cheaper weapons. Not only does this save me money for the next round, but if I get a kill with a shotgun or a submachine gun I get a larger kill reward (see above). One of the most obvious anti-eco rounds of the game is the second round, after winning the pistol round. Many professional teams have started doing broken buys (where one person might buy something but others don't) after losing pistol round, but at lower ranks in matchmaking or in a pug most teams will choose to save until the 4th round after losing pistol round. A second-round anti-eco buy by the team that wins pistol round can often boost your economy (SMGs and shotguns give a greater kill bonus) and ensure consecutive wins. On anti-eco rounds, many players prefer to buy the UMP, the MP7, the Nova, or the SSG08. Some will buy a better pistol and a full set of nades. Stay away from the P90 during anti-eco rounds. It costs almost as much as a rifle, and you will only receive $300 for a kill, defeating the purpose of the anti eco. Force buys occur when a team probably should be saving but can't afford to. For example, if a match is 9-14 for the other team, it would be important to buy whatever we possibly can afford, because if they win the next round (bringing the score to 9-15) the best we can do is tie the match 15-15. At a point like this, it would be important for players on the losing team to buy whatever they can to ensure the win. The P90 is a very popular force buy gun because of its long range, high power, and large magazine size. Others will buy a FAMAS or Galil. Often times players will choose to buy a better gun and forgo grenades or armor. Players can full buy when the whole team has enough money. A full buy consists of buying a rifle of choice, kevlar and a helmet, and whatever grenades are needed for the strategy. Most players generally buy four grenades every round when they full buy. Many players also choose to purchase a better pistol, especially if AWPing. Occasionally a team may choose to have a mixture of players full buying and some partial buying, or with some players partial buying and others saving. This could happen if only one player on a team died and had to rebuy, but the team did not have enough money to purchase a drop for this player. That player may choose to buy a cheaper weapon, such as a FAMAS or a shotgun, and forgo grenades. Another example is if a player aces the pistol round (ie, the player kills the entire enemy team) and therefor has a lot of money, they may choose to make a second round purchase while the rest of the team saves. Counter-Strike is different from other FPS games in a few fundamental ways. These differences make Counter-Strike one of the most difficult and most tactical shooters of all time. Aim matters. In many FPS games, close is good enough. In Counter-Strike, you must be exact. Money management instead of item management. You don't have classes to choose from, you can't gain advantages by having different loadouts, you don't get kill streaks, and you don't level your character up. The entire system is based around what weapons you can buy every round with the money you earned. Counter-Strike:Global Offensive also differs from other versions of Counter-Strike in a couple of ways. Different money system. No other version of Counter-Strike gives you a money bonus for getting kills with the "hard" guns. Greater viability of weapons. In earlier CS, it was AK/M4/AWP/MP5. That was it. In this game, many more weapons actually work properly, and others are made more viable simply by the greater kill rewards. Smaller hitboxes. This image, taken from the steam forums, shows the differences between the hitboxes in each version of the game. 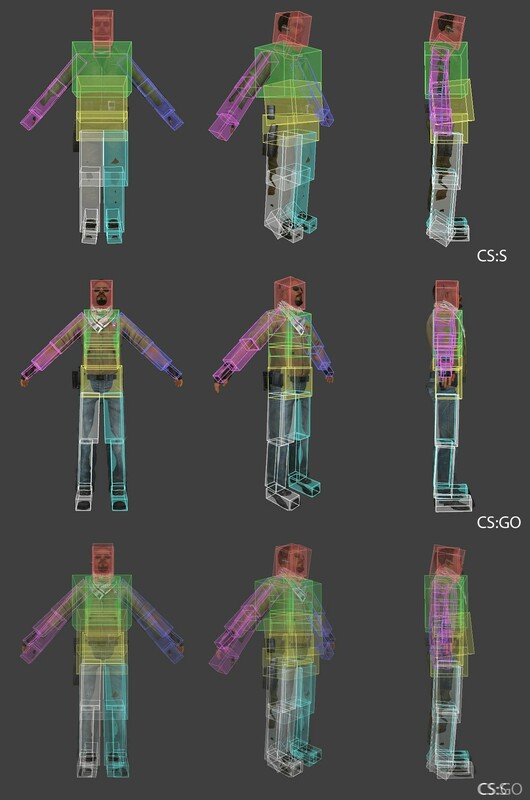 EDIT: As of 26 March 2014, the hitboxes in CS:GO now look like this. Here is a side-by-side comparison of old vs new. Different movement. Your character will move very differently in this game than in others. It will accelerate faster and decelerate slower. You will have less jumping penalty and a greater crouching penalty. Crouching no longer increases accuracy, though it does decrease the spread and decreases the accuracy reset (the amount of time it takes for your bullets to be accurate again after jumping, running, or shooting). AWPing and scouting are both harder. The deagle is more balanced. The M4 and USP no longer come with an equippable silencer. Instead, they are unique weapons (the M4A1-S and the USP-S) that must be equipped through your Loadout. deadtalk in competitive modes allows you to communicate with your team even when you are dead, as if you are in Mumble or Teamspeak with them. In hostage mode, you only have to rescue one of the two hostages. (These hostages can appear randomly in two of the preset locations on the map each round.) Instead of having the hostage follow you, you carry the hostage to the rescue zone, so you no longer have to rely on faulty AI. Your movement speed is slowed to 200 with any weapon while holding a hostage (don't take out your knife thinking you'll run faster - you won't). In addition to many community supported game modes, Counter-Strike:Global Offensive comes with a growing number of official game modes. Each is different and each has a different purpose that can be accomplished by playing them. To play a game in any of these game modes on official Valve servers, launch the game, choose Play, and then choose Find a Game. This will open a menu for you to choose what type of game mode you want to play. Deathmatch is a style of gameplay that does not have rounds or objectives. Players resapwn immediately after dying. In Deathmatch players choose their own weapons from the buy menu and the goal is simply to get the most points by the end of the game. "Harder" weapons (such as shotguns or submachine guns) give a player more points per kill. Deathmatch is a great way for a new player to become familiar with the buy menu and a great way to become more familiar with the most important guns. You can practice the same gun the entire match to really start to learn how to shoot it. Valve's official version of Deathmatch also allows a player to be given random weapons on each respawn (another good way to get familiar with all the weapons) or to use a "bonus weapon" and get more points per kill. Playing Deathmatch will also help a new player learn to distinguish enemies from friends and learn the common competitive maps. There are a large number of community deathmatch servers running a community-made mod called Sourcemod Deathmatch. In community Deathmatch servers, players pick their weapons through a text menu rather than through the buy menu, so a new player can't gain familiarity with the buy menu, and there are no "bonus weapons" to gain more points. It's a more "vanilla" version of Deathmatch than the mode offered by Valve. Also known as GunGame, Arms Race has the player progress through each gun by getting kills to "level up" to the next gun. Arms Race does not have rounds or objectives and players respawn immediately after dying. The purpose of the game is to get through all the guns the quickest, and win the game by getting a final knife kill. Arms Race is a really good way to get used to the fast pace of the game, get used to picking out enemies from the background and recognizing friendlies, and to get a basic familiarity with every single weapon in the game. It's a great place for new players to start. The largest drawbacks of ArmsRace is it is played on Valve's smaller, non-standard maps and you only get to practice with each gun for a short amount of time. Demolition mode is a really great introduction into competitive Counter-Strike gameplay. The mode is round-based (you won't resapwn immediately when you die - you have to wait until the next round) and the game is built around the bomb detonation objectives (though with 6 players per team). The game is played in two halves, 10 rounds in each half, with the winning team being the first to win 11 rounds. Friendly fire is disabled. In Demolition mode, you don't purchase your guns or equipment. A gun is given to you at the start of each round, as well as kevlar and a defusal kit. If you get a kill with the given gun, you get a new gun the next round; otherwise you must play the next round with the same gun. If you get multiple kills, you can get a variety of grenades for the next round. In Demolition mode, the guns start out easy (AK-47 for the Ts and M4A4 for the CTs) and progress to more difficult-to-shoot weapons like the Nova or the MP9. The final weapons for each team are sniper rifles. You must get at least one kill per round to progress all the way to the final weapon. Check out Demolition mode if you've started to get comfortable enough with shooting the guns and finding enemies and you want to step into objectives-based gameplay. It's a really good introduction that allows you pick up on the subtleties of objectives-based play without having to also worry about money management or weapons management. Demolition is also played on Valve's smaller maps. Flying Scoutsman is Valve's take on the popular CS mod ScoutzKnivez. In this game mode, players spawn with just a Scout and their knife. Gravity and air friction are reduced, so players can jump high and strafe really fast while floating down. The goal of the mode is to kill the enemy team with just your scout or knife. Players do not respawn, and the round ends when one team has completely eliminated the other team. This mode is played on Valve's smaller maps. Classic Casual game mode starts to bring all of the components for competitive Counter-Strike together into a low pressure game mode. Classic Casual is a standard Counter-Strike game mode where each team has to accomplish their objectives by buying new weapons every round. Some of the standard competitive settings are changed for new players and to make the setting more casual. You will pretty much always have enough money to buy a gun each round, because you are given armor and a defuse kit. Friendly Fire is disabled, so if you accidentally hit a teammate or throw a grenade poorly it won't hurt anybody on your team. Round times are 2:15 so if you get lost on a map you'll be able to find your way out without running out of time. And you only play a maximum of 15 rounds, instead of 30, with no switching teams in the middle, so you can play on a lot of the maps in a short period of time. You can begin to learn a bit about the money system and about how to manage your money to buy more expensive guns or a better grenade loadout, but some of the money bonuses are different in Classic Casual. You can practice very basic teamwork as an individual - for example, calling very basic strats or player positions - but since DeadTalk is off in Classic Casual mode you won't be able to do any higher level strategizing. Classic Competitive is Valve's ranked matchmaking system. I will cover this more in depth here. Classic Competitive is "pure" Counter-Strike. The match is a best-out-of-30, with each team playing 15 rounds as a CT and as a T. Play ends when one team reaches 16 rounds and clinches the match. The game can also end in a 15-15 tie, as Classic Competitive does not allow for overtime. The economy is normal, unlike in Classic Casual. Round times are 1:55, and AllTalk is off, so the other team can't hear your strategies. A cool feature of CS:GO that was absent from other versions of Counter Strike is DeadTalk. DeadTalk allows your teammates to hear you even when you are dead, similar to all players being in a Mumble server together. It allows for greater competitive play even when playing with random strangers. Classic Competitive is ranked matchmaking. That means that based on your wins and losses you will be assigned an Elo rank. This rank will attempt to match you with and against similarly ranked people. If all is working well, you will win about 50% of the games you play, so it can be very competitive. If you start winning more than 50% of your games, expect to rank up soon. However, if you start losing more than 50%, a downrank is imminent. WingMan is a 2v2 competitive game mode that is played on classic maps but with only one bomb site available. The match is a best-of-16 (8 rounds per half) with 1:30 minute rounds. The economy is slightly adjusted to accommodate a shorter half. WingMan is ranked competitive play, with a competitive rank that is separate from your Classic Competitive rank. If you don't want to play in Valve official servers, there is a huge variety of community servers, from super modded fun servers to highly regulated pug servers. Community servers can be accessed through the Play tab in game, either by choosing Community Quick Play (this will put you in a random community server that contains at least three humans) or by choosing Browse Community Servers and finding a server that interests you. If you find a server you like, you can add it to your favorites by hitting ESC while in the server, choosing Browse Community Servers, and then hitting the Add Current Server button. If you're not in game, you can also add a server to your favorites by IP address. Here is a picture guide to adding lots of servers at once. Some community servers (such as CEVO, ESEA, and Faceit) must be accessed through a website or a client. Playing in community servers is a great way to find friends to play with. Counter-Strike is first and foremost a team game, and finding people you get along with and who play in a way that compliments your skill-set can allow you to develop a more regular team that you play with frequently. This can really enhance the Counter-Strike experience. The other great thing about community servers is the huge variety of customized game types. For example, if you like Classic Casual but hate having AllTalk on, there is probably a server out there that is exactly Classic Casual but without AllTalk. You can probably find anything you want if you put in the time to go through all those servers. If you're wanting to become good at Counter-Strike rather than simply play it casually to have a good time, you're going to need to do some dedicated practice. Playing in "pub" servers will only get you so good. One incredible way to train your aim in CS:GO is by practicing on aim_botz, a community map that you can download by hitting "Subscribe" in the workshop. This map allows you to pick a weapon, pick moving or stationary targets, and pick target distance. The targets won't shoot back so you can practice your aim without the stress of also having to focus on not dying. I recommend this map to anybody who is having any trouble with aim. Another great way to practice your aim is to play Deathmatch. Deathmatch allows you to get the greatest number of kills in the least amount of time because you resapwn every time you die. I recommend playing Deathmatch on community servers - Valve keeps their server tickrate at 64, but many community Deathmatch servers up their tickrate to 128. (Tickrate is similar to a server's FPS - it dictates how frequently the server should update the world to the client. The higher the tickrate, the more accurate a picture the client is receiving. Therefore, hit registry can seem a lot worse in a 64 tick server than in a 128 tick server.) Just be sure that the server's tickrate is not dropping too much. You can check this by checking the "sv" and/or "var" value when you type net_graph 1 into console. I tend to look at this number and only play in servers where the server mostly stays at or below 1.0. Many community Deathmatch servers are wracked with horrible tickrate variance. Ideally, a server's tickrate should never vary by more than 1, but since Sourcemod Deathmatch is a hefty plugin you should look for servers whose variance stays below about 2.0. AbsurdMinds has a 128 tick, low-variance Deathmatch server. If you can find a Free For All (FFA) Deathmatch server, this will be even better. In FFA, all players, regardless of what team they are on, are your enemies. Playing FFA Deathmatch will greatly improve your reaction time as you now have twice as many enemies to fight. Avoid Headshot mod Deathmatch servers as much as possible. In Headshot mod, you can only kill people with headshots - body shots don't register. Headshot mods are bad for two reasons: (1) the mod itself screws with hit registry; (2) all your opponents are crippled, because they can only kill you with headshots, so you're basically choosing to play against less-capable opponents. You do not need a mod to practice headshots - play on aim_botz or go into a normal deathmatch server and practice "one-clicking" your opponents with an AK-47 (shoot only one bullet at a time and aim only for the head). Another great way to improve your aim is by do deathmatch-style practice offline with harmless bots. This affords you the greatest opportunity to relax and really get your shot down without having to stress about how much you are dying. There are also some special maps in the map workshop made especially for practicing your aim. Professional player Friberg talks about one of his favorite practice maps here. Another important thing to practice is grenade placement. How can you smoke off an important area from enemies without peeking out and getting shot? How can you use a molotov to stop an enemy rush or clear out a bombsite? Can you shoot through the wall here and pick off an unsuspecting Terrorist? These things can be easily practicing on an empty offline server (Choose "Play Offline with Bots", but then choose "No Bots"). You can give yourself any weapons or grenades you want with these commands. There are also many community made maps to specifically practice throwing grenades. For example, this map teaches you smokes for de_mirage. Moving from one area of the map to another in the most efficient way possible, and knowing exactly how long it takes, is an important part of being a good player. CSGO player Yesber has made many CS:GO maps for practicing your movement on competitive maps. Some things can only be practiced with a team. How can two people coordinate their flashbang with a molotov to burn a blinded player hiding in an obvious spot? How can a team time their entrance into a bombsite from a few different angles? If you have a few friends to play with, work on using each other to complete the objectives instead of just relying on yourself and your own abilities. Figure out how you can use each other to the greatest advantage. One great way to get ideas for your gameplay is to watch other people play, especially professionals. Valve has a built in "Watch" system that lets you watch high ranked matches; HLTV.org is another great place to download demos of professional matches. Re-watching your own demos after a match is also a great way to figure out what you may have done wrong and what you could do to improve your game. Counter-Strike:Global Offensive competition has a few variations, but generally it is played with teams of five on defusal maps. Most leagues will have two fifteen-round halves and allow a team to clinch at 16 rounds. Many leagues offer overtime to determine the winner in the event of a 15-15 tie. Overtime rules vary. Most leagues have 1:55 round times and 0:40 bomb timers, to stay consistent with Valve's rules for their major tournaments. Very few leagues allow players to play on hostage rescue maps - Valve's official MatchMaking is one of the few. 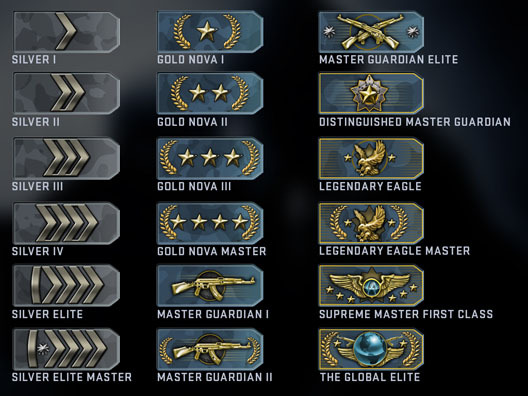 There are a number of options for competing in CS:GO. Matchmaking puts people into matches based on their Elo rank. The Elo ranks are shown below. An Elo rank is not a pure description of a person's ability or skill. It is a representation of relative skill - that is to say, it represents how likely you are to win a match against other players. If you are at the "correct" Elo rank, you should win about 50% of your games and lose the other 50% against players of the same rank. If your Elo rank is too low, you will win greater than 50% of your games and rank up. If your Elo rank is too high, you will lose greater than 50% of your games and rank down. The exact formula for Elo rank is undisclosed by Valve, but most people agree that it is weighted very, very heavily on whether your team wins or loses and weighted very little on your individual kill/death ratio (KDR) or other individual performance metrics. Many people purport to have downranked after losing a few matches with a 30:10 KDR and many people say they have ranked up after winning a few matches with a 8:24 KDR. You will only receive your Elo rank after winning 10 matches in ranked matchmaking. Before you earn your first Elo rank, you will be limited to two wins per 24 hour period. So if you play your first two matches in ranked matchmaking and win them both, you won't be able to play ranked matchmaking for 24 hours. However if you lose them both, you'll be able to keep playing until you have won two matches in the last 24 hours. By playing in Valve's official MM servers, you are putting yourself in a position where you could be banned from Valve's MM servers and any community server with server cvar "sv_kick_players_with_cooldown 2". Bans increase in severity for each consecutive ban, and player must play for an entire week with no bans in order to drop back to the previous ban-severity level. Valve has two systems to attempt to make the matchmaking experience more enjoyable. Trust Factor is much more complicated but has received many complaints for being ineffective. CSGO attempts to calculate a "trust factor" of a player by looking at undisclosed metrics that may include things like number of hours played, number of games on the Steam account, age of the Steam account, number of reports and commendations, and other such factors. By matchmaking with Trust Factor, CSGO will attempt to place you in matches with people who have a similar Trust Factor. Prime Matchmaking is an older and simpler system, but some contend it is more likely than Trust Factor to result in a pleasant gaming experience. To be entered into Prime Matchmaking, a player must have a CS:GO XP Rank of above 21 and have a phone number tied to their CS:GO account. If you have a full team of your own, you can often find scrims with other teams. Going into community servers with a lot of community members and asking if people want to scrim, posting to other communities' websites, joining IRC, posting to reddit, third party websites such as pcw, or adding #scrim to your steam name are all common ways of finding scrims with other teams. One draw back to privately organized scrims is that often times the games can be horribly mismatched; other times, scheduling difficulties or problems getting all ten players present in the server lead to a lot of wasted time. A PUG (Pick-Up Game) is similar to Valve's matchmaking but is generally organized through an official website or league. Many PUG services require you to install a third party anti-cheat client, and generally provide a higher competition level than you can find in Valve's MM servers. They also usually include some type of ranking system to make evenly matched teams, but do not include a ranked queue and can therefore occasionally lead to very poorly balanced matches. Gives preference to placing you on a team with your "buddies"
ESEA a paid pug service and one of the most popular, but due to serious illegal and unethical business practices we cannot recommend use of this service or any software they provide. There is currently a limited number of leagues for CS:GO providing seasons or ladders for competition. A competitive season usually consists of 16-20 teams competing against each other weekly on maps chosen ahead of time, with the winner typically being the team who wins the most number of games throughout the season. A ladder usually consists of a number of teams challenging each other to matches on their choice of map at their own leisure to advance up the ladder. These sites contain news and information about competitive esports, including CS:GO.